Woman says police state is "out of control"
A woman said she missed her flight at a Houston Airport after she refused to let a TSA agent test her bottle of water. The TSA agent then detained the woman and didn’t allow her to board her flight because of her “bad attitude”. 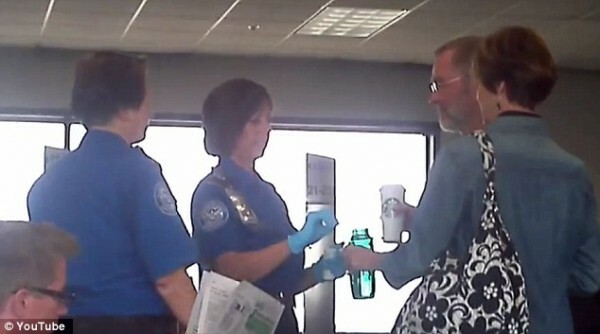 ‘I was not allowed to board a plane (even though I had already been through airport security) because I drank my water instead of letting the TSA “test” it.’, the woman said in the video. In the video, the woman asks the TSA agent point blank if she is being stopped for security reasons. ‘Let me get this straight, this is retaliatory for my attitude, this is not making the airways safer it’s retaliatory,’ she says. ‘It pretty much definitely is’, he responds. ‘Liquid screening at gates is random and it isn’t happening at every airport every day,’ the TSA said on its blog post in defense of the practice. ‘The TSA is way out of control. I understand that my ranting to one of these $11.00 per hour TSA goons probably does nothing, but you have to say something. Whats next…perhaps the TSA will come to your home prior to your drive to the airport? The police state of the U.S. is OUT OF CONTROL!’ the passenger that posted the video protested.